Conserve water, reduce pest and disease pressure, and have less weeds in your garden by using Drip Irrigation Tape. Put water only where your plants need it! 8 mil tape thickness with 12″ emitter spacing and 1,640 ft. of drip tape per roll. Our Drip Irrigation Tape is the most effective and environmentally friendly way to water your vegetable garden. Drip Tape allows you to use less water while watering more effectively. This is because you are only placing water directly where your plants need it — at the roots. Because you’re not watering the leaves, disease pressure and pest pressure will be greatly reduced. You also will have much fewer weeds between the rows in your vegetable garden. With overhead watering, many areas of your garden are unnecessarily watered, which results in watering weed seed and germinated weeds that you don’t want to grow. However, with drip irrigation you only place water underneath or beside the plants and you don’t water those spaces between rows. Each roll of our 8 mil Drip Irrigation Tape includes 1,640 feet of drip tape with emitters spaced every 12 inches. The 12″ emitters work great for transplanting because the emitters indicate the plant spacing for you. For example, if you want tomato plants at 2 ft. spacing, then plant a tomato plant on top of every other emitter. When planting seeds or transplants closer than 12″ spacing, the water output of the emitters is great enough to cover the spaces between emitters. It keeps the Drip Tape straight along the row, keeps the water emitters facing upward and prevents the tape from twisting over time. It prevents rats and other pests from being able to chew into the Drip Tape, causing leaks and headaches. By burying the Drip Tape, you can direct seed on top of it with our Hoss Garden Seeder that has a rolling coulter furrow opener. Our Drip Irrigation Tape also makes it really easy to fertilize your garden while you water it, saving you time and energy. By installing a Fertilizer Injector between the spigot and your Drip Irrigation system, you can easily inject water soluble fertilizer into your watering system so that you feed your vegetable plants while you water them. Row length – Our Drip Tape can be used on a maximum row length of 100 ft. at 8 psi. We don’t recommend using on rows longer than 100 feet. If rows are too long, water will not be equally distributed throughout the Drip Tape along the row. 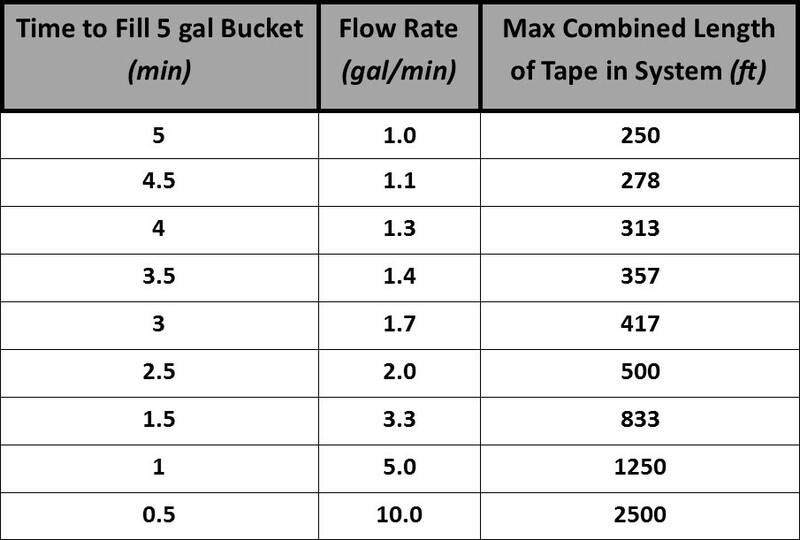 (8 gal/min) / (5 gal/min) x 1,250 ft. = 2,000 ft.
Use the chart below as a reference.